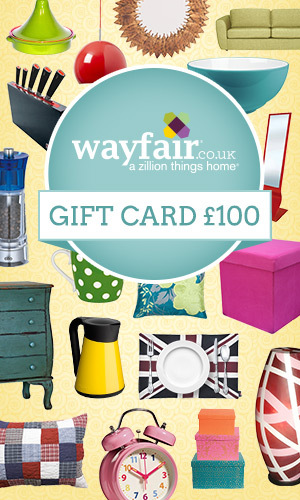 Win a £100 Wayfair homeware giftcard! **GIVEAWAY CLOSED** | Travel. Style. Food. Have you heard about Wayfair.co.uk? They are an online home ware retail store with over 350,000 items in stock to fulfil all humble abode requirements! Wayfair.com is huge over in the United States, so the newly launched Wayfair.co.uk is the UK and Ireland’s way to access the excellent products that Wayfair have to offer. The products available on the website are from top manufacturers around the world, and Wayfair guarantees absolute satisfaction. Product selections include all you can think of for the living room, bedroom, lighting, garden, bathroom, office..and of course kitchen and dining, which are my favourite sections! They have some really quirky and innovative stuff in great colour selections and designs. So where am I going with this? Well…great news! The very cool people over at Wayfair have offered one of you guys a chance to win a £100 giftcard, to use on anything of your choosing on the website. Not only that, but they’re taking care of the shipping too. See? I told you they were very cool. Since I love dining out, dining in and all things to do with food, above are just some of the things I would choose on the site if I won the nice prize myself! Fondue Carousel with Cast Iron Bowls; I would love to own my fondue set, a strong cast iron one like this for entertaining friends. Non-stick Springform Cake Tins; Cheesecake is my favourite dessert and these tins are perfect for making a few in different shapes and sizes. Baroque & Rock Champagne Flutes; A colourful way to enjoy one of my favourites! Other colours also available. Fancy. Espresso Cups with Silicone Rings: A twist on regular espresso cups, in very arty mondrain-esque designs! Scout Scrolled Bistro Wine Rack: This rack does remind me of something you would find at a bistro. Classic with lots of compartments and the price is incredible. ONE: Follow TravelStyleFood on Bloglovin‘ or by email. TWO: Like TravelStyleFood.com on Facebook. THREE: Comment below to let me know when you’re done and let me know what you’d pick on the website if you won. FOUR: I just found out that I’m shortlisted for the Image.ie Blog Awards, under the food category! If you would like to vote for me, I would really appreciate it. This is optional, but if you like my posts and want to support my blog, nominations and voting are here.